September 10, 2007 can easily be termed as another shameful day in the history of Pakistan. The government despite having a clear-cut decision from the Apex Court did not allow former prime minister Mian Nawaz Sharif to stay in the country. For people of Rawalpindi and Islamabad, September 10 was another memorable day. The memories may not be very pleasant though. The government had restricted movement of people at different points in Islamabad and imposed section 144 in Rawalpindi, forbidding assembly of five or more people. Though aimed at stopping PML-N workers from marching towards Islamabad airport, the brunt of the whole exercise had to be faced by the ordinary people who were treated like captives by the state machinery. The big man with the velvet voice is no more. The great tenor Luciano Pavarotti died at age seventy one, and even if you are not an opera buff, you must have caught glimpses of the news on one of the channels while channel surfing. When his predecessor Enrico Caruso died, the then King of Italy ordered that the chapel reserved for the funerals of royalty be opened for the occasion; well there is no King left now to make the grand gesture, but to his millions of admirers, this too was a royal occasion. Authorities in Swat term the spiralling militant attacks on law enforcing agencies and civilians as the beginning of guerilla warfare. Violence has shattered the peace of Swat in the last two months, known for its unmatched beauty and hospitality. Since the 1950s, Pakistan-US relations have been an interesting subject for foreign policy analysts.-- reminiscent of a roller coaster ride with abrupt lows and unpredictable highs. How does one explain a country deporting its own citizen? Even if the agreement between Nawaz Sharif, Saudi Arabia and the Pakistan government stipulated that he stay in Saudi Arabia for 10 years, what legal standing could it possibly have had? In any case, the Supreme Court had clearly -- and quite correctly -- ruled in a petition filed by the Sharifs seeking unhindered return to Pakistan, that there was nothing in the Constitution which prevented them from not coming to their native land and that constitutional guarantees applicable to all Pakistani citizens in such a situation could not be overridden by any undertaking that they may have given to either their own government or an overseas country. More than 3000 PML-N workers were arrested from different parts of country, ahead of Nawaz Sharif's arrival. The roads leading to Islamabad from other parts of the country were completely blocked at one point on September 10. According to official figures, 56 police check-posts were set up in Rawalpindi alone to stop the PML-N processions coming from other cities towards the Islamabad airport. Most of the bus companies were directed to suspend the Lahore-Islamabad service on September 9 and 10 through motorway, while GT road was also partially blocked at different points. Every vehicle, even the private ones, were being scanned by the police to make sure that no PML-N worker or leader could reach Islamabad. Communication between NWFP and Islamabad was blocked at the Attock Bridge. Many of the PML-N workers had come to stay in surrounding localities of the airport with friends or relatives. They were not allowed to come out of these colonies as the main entrances of all these residential colonies were totally surrounded by heavy contingents of police and none dared to breach these security measures. Despite the original plan to return through Gulf Airline and reach Pakistan around 11:30 am, Nawaz Sharif landed at Islamabad through a PIA flight (PK-786) at 8:42 am. He also did not allow Shahbaz Sharif to return to Pakistan with him at the eleventh hour. Ishaq Dar, senior party leader, justified the decision at Heathrow airport by saying that the purpose behind these moves was to counter the government's strategy and to confuse it. At the end of the day this move confused the PML-N workers, who had planned to reach the airport around noon. "I was really surprised by the decision. The party leadership in Pakistan was not consulted before taking the decision," says PML-N secretary general, Iqbal Zafar Jhagra. Nawaz Sharif remained on Pakistani soil for more than four hours. He was arrested, humiliated by the low ranked officers of different government agencies and sent once again to Jeddah. Except three female workers who succeeded in getting close to the airport, none of the PML-N party workers were in attendance. It was the first real opportunity in seven years for PML-N to show its street power, but despite tall claims by its leadership of bringing out one million supporters to receive Nawaz Sharif returning from his seven years exile, only a handful of diehard activists forced their way into the Islamabad airport; most of them were arrested. Even after, the government made Nawaz Sharif leave for Jeddah, no protest was staged by PML-N workers in cities like Lahore, Gujranwala, Faisalabad, Sialkot, and Chakwal considered to be strongholds of PML-N or Peshawar and Quetta strongholds of Nawaz Sharif's political allies, Asfandyar Wali and Mahmood Achakzai respectively. PML-N did, however, file a constitutional petition in the Supreme Court on the very same day against the deportation of Nawaz Sharif. The petition was filed by PML-N MNA Khawaja Asif, under Article 204 of the Constitution, challenging the sending of the former prime minister into exile in disobedience of the Apex court's verdict on August 23 that allowed the Sharif brothers to return to Pakistan. Chaudhry Aitzaz Ahsan while taking to TNS strongly criticised the decision of sending Nawaz Sharif back to Saudi Arabia. "I think it's a clear-cut case of contempt of court," he says. Government officials are obviously not ready to consider the whole episode as contempt of court. One of the most interesting statements that came from the government to support their act was by Chaudhry Shujaat Hussain. "Nawaz was deported to Saudi Arabia as Saudi King Abdullah wrote a letter to the president, in which he quoted a Hadith related to keeping promises," he said in a talk-show. He also said that the government was ready to let Nawaz a free hand but the Saudi King's letter changed their decision. Khawaja Saad Rafique, PML-N central leader rejected the above statement, while talking to TNS. "PML-Q should also remind General Musharraf," he said, that by joining the army he also taken an oath not to take part in politic. "He breached his promises many times subsequently. What does Chaudhry Shujaat think about him?" Rafique asks. "The party will keep on staging protests on platform of APDM until the government follows orders of the Supreme Court." "The rulers are trying to create a civil war like situation," says Siddiqul Farooq, central leader of PML-N, and threatens to start country wide movement if Nawaz Sharif was kept imprisoned in Saudi Arabia. "The 'brotherly country' may lose respect in Pakistan for its direct involvement in deportation of Nawaz Sharif." On its part, PML-N leadership is citing reasons like unprecedented security measures and arrests of thousands of PML-N workers for the rather poor show it managed to put up. The claim of arrest of more than 2000 workers may indeed be true but can it be accepted as an excuse from the single largest party in the National Assembly as well as in two provincial -- Punjab and NWFP -- assemblies just eight years ago. The party must accept that it completely failed in mobilising its worker on one of the most important events in recent years. The way the leadership got arrested was because of lack of planning on the part of PML-N leadership that is clearly divided in groups; instead of working as a team every group tried to show its strength individually. Besides, there is a feeling that the party is not too keen on grooming new leadership. Many think that Makhdoom Javed Hashmi has been sidelined in party matters; he was not included in taking crucial decisions in the planning of Nawaz Sharif's return. This sent a negative impression to workers. Hashmi also did not try to play any role on September 10. All the arrangements and planning to welcome Nawaz Sharif were made by the group led by Chauhdry Nisar Ali. The party leadership admits that its show was poor. "It is obvious that we lacked planning but there was no grouping in the party," says Saad Rafique, central leader of PML-N. The performance of Nawaz Sharif's political ally, All Parties Democratic Movement (APDM), was even more disappointing. Important parties like Jamaat-e-Islami (JI) and JUI-F were marked by their absence. Not even a single protest rally was staged by both these parties in Islamabad/Rawalpindi or any other city, although both these parties especially JI was making tall claims of receiving Nawaz Sharif at the Islamabad airport by breaching all security measures. PML-N should know that both parties have very close links with the establishment; more than that they could never dare defy a decision that had anything to do with Saudi Arabia because of their decades long ties with Saudies including the finances for the Afghan war. The government did everything according to its wishes. This clearly indicates that the establishment still is the strongest player in Pakistani politics and plays a very significant role in the making or breaking of political coalitions and even parties. The way the establishment managed to break Alliance for Restoration of democracy (ARD) is really credible. Six months back, Benazir Bhutto and Nawaz Sharif were vowing to launch a combined movement for the restoration of democracy in Pakistan. But on September 10, the differences between two parties had widened so much that PPP remained totally indifferent to the arrival of Nawaz Sharif in the country. The roads and streets of Rawalpindi were deserted from the start of the day. The reason was that the government had announced September 10 a school holiday and confiscated thousands of motorcycles during the previous couple of days. Malik Tanweer, a resident of Rawalpindi, says he was stopped by policemen on September 7 when he was on his way to his office. "They asked me to dismount from my motorcycle that I did. The next thing they did was that they handed me a chit and asked me to get my motorcycle back on September 11 by producing the same chit in Saddar Police Station," he tells TNS. Tanweer says the policemen refused to budge despite his repeated requests. "On my insistence a police constable told me that according to intelligence agencies reports most of the PML-N workers were trying to reach Islamabad on motorcycles. The police are just taking pre-emptive steps and nothing else." Tanweer says one could see thousands of men, women and children walking on roads and arguing with taxi drivers to take them to their homes. "It's a pity that the police did not even spare women or children; they were as ruthless as one can think of." The business activity remained low in the twin cities. A reason cited for this was that the business community thinks the government is not capable of stopping protesters from destroying private property. "We stayed at home all day and watched transmission of news channels. Believe me, these channels offer more entertainment than any of the popular comedy or entertainment channels," says Irfan Hashmi, a real estate adviser in Rawalpindi. The life of people living in the vicinity of Islamabad was worst hit. Ghulam Haider, a resident of Defence Colony, Qadeer Khan Road, Rawalpindi (situated 2 kilometres away from Islamabad airport) tells TNS that he could not take his newborn baby to the doctor due to the restrictions imposed on the people of his community. The police had blocked all routes to Islamabad airport by placing pushcarts, containers, barricades etc at PAF Colony, Khanna Pul, Faizabad, sector I-8, Zero Point and so on. Even truckloads of sand and stones were unloaded on roads and tree trunks placed to block the roads. "The largest checkpoint was at the Kroll intersection where traffic from Lahore and Islamabad turns towards Rawalpindi," he says. The media personnel were also stopped from performing their duties. Journalists who had reached Islamabad airport on Sunday were asked to leave the premises immediately. "We protested at this decision and after long negotiations were asked to stay in the parking lot of Islamabad airport," says Amanullah, an Islamabad-based journalist. He says only those journalists could reach the airport who had left for the venue a day earlier. "Many of our fellow professionals coming from other parts of the country could not enter the twin cities," he adds. It was only after 2 pm on September 10, when Mian Nawaz Sharif's plane had taken off, that people could come on Lahore-Islamabad Motorway or Grand Trunk (G T) Road from any of the entry points. Pavarotti was lord of the opera for almost fifty years, and if his fame did not exactly match that of Caruso, it must be because for some of the time, most unusually, he had to share it with Placido Domingo. The Guinness Book had to revise its records many times, shunting between the two, to keep up with who had received the longest applause in opera. Eventually of course the two landed up together in the 'Three Tenors' concert at the 'Baths of Caracalla' in Rome to go with the football world cup and later on in Los Angeles where, in a heart warming gesture they serenaded the other great pair of Frank Sinatra and Gene Kelly. It is true though that the album spawned at least two more. I have two CDs, both called 'The Three Tenors' giving the editors' own version of the title from history; the one includes Caruso, Gigli and Jussi Bjorling, the two Italians and one Swede, and the other one has McCormick the great Irish tenor. It is silly to make comparisons, and impossible to make up one's mind, but one is grateful that the compendiums were put together. Both are treats! The one thing that comes through loud and clear from the album is that the man was a great showman along with being a great singer. The voice was as wonderful an instrument as one could wish, but there was also a charming personality and a captivating stage presence which won over an audience and held it. But then that was to be expected. Pavarotti was Italian! That seems to be a gift nature reserves for Italians. That becomes obvious even from a first reading of the 'Three Tenors' album. The other two, Domingo and Carerras are both Spanish. Domingo may arguably be the most handsome man to have sung opera, but people talking of him are careful to describe him as the greatest 'Dramatic Tenor' of our times, and throughout the concert one is aware that the two are instinctively deferring to Pavarotti as first among equals. There is no question that for sheer exuberance and warmth, no one matches the Italians. 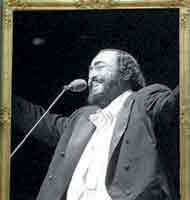 That was true of Caruso and it was true of Pavarotti. There is the story about Caruso that at the beginning of his career the producers wanted to give him his first leading role, but were not quite sure of their own judgement, so they thought they would leave it up to the composer Puccini. It is said that Puccini sat listening silently as Caruso sang a few songs, then raised his head and said, "Who sent you to me? God?" Puccini was a wise and perceptive man, and I cannot help wondering what he would have said if he heard, for the first time, the miracle that was the voice of Luciano Pavarotti! "This is guerilla warfare as the small groups of unidentified militants strike and then disappear. These people are highly-trained and know the art of dodging security forces," a well-placed source in the administration said. The official as well as the people express the apprehension that Swat was heading towards Talibanisation following bomb attacks on video shops and threats to cable operators, cinema owners, electronic shops, schools and women to wear fez-veil. Suicide attacks and bomb blasts were unleashed in Swat and its adjoining Lower Dir district with the start of 'Operation Silence' on the Lal Masjid and Jamia Hafsa in the first week of July. However, it was Maulana Fazlullah, the son-in-law of Sufi Muhammad, who first incited violence and urged people to burn TV set and CDs. The law enforcing agencies' had to bear the brunt of Operation's consequences in July, as dozens of army, police and Frontier Constabulary men were killed in attacks at Chakdara in Lower Dir, Matta and Mingora in Swat and also in DI Khan district. The government had deployed army in the restive Swat to control the situation but the militants turned the tables by inflicting heavy casualties on them through suicide and improvised explosive devices' (IEDs) attacks putting them on backfoot. Law and order situation improved in Lower Dir but violence in Swat still continues to wreak havoc with people's lives and property. A van of tourists heading to the picturesque Kalam valley was attacked on Kalam-Ushu road on August 13, killing five tourists and seriously wounding another four. The deceased included a doctor, a guest from Faisalabad, a hotel manager and two others. In July, the militants used to attack army and police and abstained from targeting civilians but with the attack on tourists they sent a message that even civilians would not be spared, a signal that caused fear among the already terrified people. The already hesitant tourists stopped visiting Kalam after the blast, bringing hotel business to a standstill. "The violence ruined tourism and hotel business in Kalam as you will hardly see one or two tourists roaming here. 250 hotels suffered heavy losses," Zafar, an official of the PTDC hotel in Kalam said. On August 30, the militants fired rockets at FC's post, killing two officials apart from wounding six others. The post was also badly damaged. On the same day, a civilian was killed and a passerby wounded when a police van was attacked at Khawazakhela-Langar road. However, police suffered no casualties. Sporadic attacks on law enforcing agencies are in addition to the major incidents. On September 5, the militants bombed a police post at Naway Kalay and injured an official. They also started fire at the post after the blast that was retaliated by police and the exchange of fire continued for 15 minutes. A brigade of 'moral police' also emerged in Swat taking on videocassette and audiocassette business, cinemas, schools, electronics and China markets. On September 7, the unidentified saboteurs blew up 48 shops in Ali Plaza and 12 in Qadria Market in two bomb blasts that also partially damaged 20 shops in the adjoining Meena bazaar. These shops included 27 video-shops, 13 mobile, 20 Chappal-maker and five miscellaneous shops. "My father had died and I am homeless. I had invested Rs.300,000 in my videocassette business, and it was the only source of my income but these cruel people destroyed it in no time. I have no idea what to do," the helpless and dejected Hussain Ali said. Ali had a CD shop known as CD-Zone in Ali Plaza. He informed that all videocassette markets were closed in Mingora owing to fear of being bombed, adding he would also abandon this business for good. The blasts didn't claim human lives as the incidents occurred at 4am when the markets remained closed. Six video shops in Matta and one in Salam Pur were razed to the ground apart from partially damaging 23 other shops and three houses. Two cinemas of the city, Palwasha and Swat, were also forced to close after threats, as movies are not screened in the said cinemas now. Abaseen Electronics and China Plaza were threatened through pamphlets to abandon selling of CD players, audio players and other un-Islamic devices or face bomb blasts. Likewise, Ali Cables was asked to wind up its business. The barbers were threatened to give up shaving off beards, after which the barbers' association imposed a ban on the same. The unseen intimidators also asked the Sangota Public School (SPS) run by Christians to renounce co-education otherwise the school would be reduced to ruins. SPS was closed for indefinite period to avoid the wrath of the militants. A historic and gigantic engraved image of Buddha at Jehan Abad was damaged by blowing it with a bomb blast on September 11. It was believed to be the biggest in Asia. The incident is reminiscent of the Taliban's unwanted action to dismantle statues in Bamian, which caused an international condemnation. Such unwarranted actions by the extremists are not only causing bad name to the country, and particularly Swat, but had also turned the progressive and tolerant society into extremist and fanatic one in the district. The station house officer of Matta, the violence-torn town of the district, was also gunned down on Tuesday while on his way to home. When contacted, the district police officer (DPO) Swat, Muhammad Iqbal, said the militants had come from the tribal belt and carried out bomb attacks in Swat to show displeasure over the government policies. "We have increased our security but these people cannot be tamed by force," he said, adding the solution could be secured through negotiations. "Anti-terrorism specialised forces should be given the task to tackle with terrorism as police were trained in normal policing," the DPO said. "The actions of militants are Taliban-styled as they blow up CD and cassette shops, relics of Buddha, ban co-education and shaves and force women to wear fez-veil," Iqbal said. He informed that Hawaldar, Pervez, was dismissed, an ASI relegated to Hawaldar and four sepoys were fined for committing negligence on September 7. The locals and police sources said that army was present in the district but didn't stroll on the streets. Unlike Waziristan and other tribal areas, militants in Swat have been hiding their identity. The residents of the district, particularly Mingora and Matta, have been petrified by the growing incidents of violence. "People are feeling insecure but police patrolling is non-existent," Salim Athar, a local journalist said. "The militants have been killing innocent citizens. They have killed my brother who did no harm to them or anybody else. Our family is grief-stricken. This is no service to Islam or the country," a young man said, pleading anonymity owing to fear of reprisal. Some people who were interviewed said that they were planning to leave Swat and settle in another country, if possible, or in interior Punjab and Sindh provinces to avoid death and destruction unleashed by militants. The locals lashed out at poor security arrangements by the government. "No incident after 9/11 in USA and 7/7 in UK took place because the governments there are serious to defeat terrorism and had made foolproof arrangements but our rulers have been wrangling for prolonging their rule and are not concerned about the security of people," an angry citizen argued. In pre-9/11 era, Pakistan's defiant nuclear programme had irked United States so much that Washington would term it a policy of constructive disengagement, manifested through threats and negative legislations. The horrific images of 9/11 changed the mindset of the credibility-starved Pakistani military dictator General Pervez Musharraf, who cleverly offered unconditional support in the war against terror. By September 12, 2001, the very next evening, Pakistan had become the front-line ally for the United States, courtesy plotters of terror attacks in New York and Washington DC. 1.Helping the states of South Asia to enhance regional stability. 2. Aiding Pakistan to strengthen economic, social, political, and democratic development. 3.Building bridges between US and Pakistani people in order to foster greater mutual understanding between the two countries. So much has happened over the past five eventful years but the Pakistan-US relations remain far from cordial. Sacrifice of over 1,000 troops, loss of lives of hundreds in 'collateral damage' and unlawfully handing over of countless citizens to the American spy agencies means little for the Bush administration amid claims of Islamabad 'not doing enough'. Five years after 9/11, much water has gone under the bridges for both United States and its front-line ally, General Pervez Musharraf, whose army has spared unprecedented number of troops as well as military wherewithal to the Afghan-bordering tribal areas. Washington is now actively engaging Pakistan's military, police, bureaucrats, and politicians to fight a war against the religious extremists who find refuge in the remote, mountainous areas of Pakistan. General Musharraf's quest for Washington's backing to perpetuate his claim to power overshadows NATO or US pre-emptive strikes across its border with Afghanistan. Though the United States has found little information to locate elusive Osama bin Laden and Mullah Omar, yet the Bush administration, American media as well as think-tanks continue to dream of the duo's presence in Chitral or tribal areas of the country. Tasnim Aslam, spokesperson for Pakistan's foreign ministry, routinely rejects the claim, asking for specific and credible information which has so far never reached the responsible offices. Islamabad gets the blame of providing safe havens to Taliban and al-Qaeda while poppy cultivation, gun-running and lawlessness reaches unprecedented heights in Hamid Karzai's Afghanistan controlled by an assortment of the world's most modern armies. Six years later, with so many captures and killings to their credit, the Pakistani military and intelligence agencies are still being openly alleged of sympathising with al-Qaeda in its fight against the West. Since the controversial U-turn of 9/11, the Pakistani society has seen more bloodshed in its streets than ever before. Suicide bombing and time-device explosions have rather become a routine across the whole country. Though Islamabad has banned radical groups such as Jaish-e-Mohammad, Lashkar-i-Taiba etc, the military operations in twin Waziristans and mock doses of enlightened moderation have given birth to an underworld of more sophisticated and organised, media savvy outfits -- the likes of late Ghazi Abdul Rashid. These neo-Islamists speak fluent English, wear western outfits, use the latest gadgets and run FM channels and websites hosted off-shores. These neo-Islamists are functioning more on the lines of Al-Muhajiroon and Hizb-ut-Tahrir. Sitting on the debris of failed foreign and domestic policies, Musharraf continues to portray his persona as the sole voice of moderation in the country. Washington is backing his power-sharing deal with Benazir Bhutto tooth and nail but terms deportation of Nawaz Sharif as an internal, legal matter of Pakistan. Predictably then, US Deputy Secretary of State John Negroponte told a press briefing in Islamabad, "Deportation of Nawaz Sharif is an internal and legal matter of Pakistan and the people of Pakistan." However, "We support a peaceful democratic transition in Pakistan." Six years down the road, the US still hesitates to publicly display tangible confidence in Pakistan. For example, responding to a question about pre-emptive strikes in the tribal areas, John Negroponte said, "Whatever counter terror activities are being undertaken, they are being carried out in complete respect for sovereignty of Pakistan." Interestingly Foreign Secretary Riaz Khan could not help but could only say, "Parameters for security cooperation are very clear and understood by both the sides." While Washington acknowledges capture of over 500 wanted al-Qaeda and Taliban activists and death of hundreds others in various military operations, the much-hyped strategic dialogue has yet to take off. The two countries launched the Strategic Dialogue in March 2006 when US President George W. Bush visited Pakistan. The first round of talks was held in Washington in April 2006. Though US Deputy Secretary of State Negroponte led the American delegation in the second round of the Pakistan-US Strategic Dialogue, there has been little tangible progress to report at any given public forum. Theoretically, a wide range of areas of cooperation, including economic cooperation, energy, science and technology, counter-terrorism, health, and education were listed as agenda items, the high profile visit marking five years of Pakistan-US relationship is marred with speculations about Musharraf's future and Benazir's stakes. While its nuclear energy deal with India makes headlines, Islamabad has nothing to report on its docile proposal for setting up of nuclear energy parks. Ironically, both the countries did not discuss prospects for cooperation on nuclear energy. The state of Pakistan-US relations could be best symbolised by the US Congress bill on July 27. The bill makes US aid to Pakistan contingent on Islamabad's efforts to fight extremist groups operating on its territory, particularly those launching operations across the Durand Line in Afghanistan. The bill also conditions aid on free and fair elections in 2008 and the restoration of democracy after eight years of military rule. Lest one be accused of defending someone who in his own time had tried to become a tin-pot dictator -- remember the 15th amendment -- the point that one is trying to make is that the conduct of the government was found wanting and basically shameful. Of course, Mr Sharif may have signed such an agreement but that should not meant that he be physically barred from setting foot and remaining in his own country. Though the media was barred from taking any footage of this sordid episode, several reports filed by reporters who were on flight PK 786 testify to the fact that the government played a double game. It lulled Nawaz Sharif into thinking that perhaps things were not going to turn out as bad as he would have expected. He was eventually taken to the VIP lounge at the airport where tea and biscuits were brought. However, it all soon changed. An official of NAB came and read out charges to him after which police standing on duty nearby were ordered to physically bundle the former prime minister into a bus from where he whisked to another plane that was waiting for him. Of course, one isn't even talking about the inconvenience to thousands of airport users, commuters and travellers by the government's sham-fisted action of sealing the airport for several hours. Also, it should be remembered that the excessive display of force used browbeat the political opposition and the PML-N activists from coming out on to the streets, and using a PIA plane to send Mr Sharif back to Jeddah all came at a cost -- a cost that is going to be borne by tax paying citizens like you and me. If this all doesn't confirm the fact that one lives in pretty much a banana republic, consider what happened after the deportation. Obviously to expect the government to have the moral courage to admit to what it had done, one saw all kinds of characters come on TV and in newspapers and say that the actions were very much in accordance with the law and were in line with the Supreme Court's judgment. How nifty! Surely, these people do not think Pakistanis to be asses of the highest order -- or maybe they do, who knows. PML-Q chief Chaudhry Shujaat Hussain and the minister of state for (dis)information, Senator Tariq Azim, both say that Mr Sharif had been given a choice -- to stay in Pakistan and face the charges against him or tell go to Saudi Arabia and that he chose to opt for the latter. This in the face of repeated statements by both Nawaz as well as Shahbaz Sharif that they were more than prepared to return to Pakistan and face the charges in court. Also, why take the journey to Pakistan only to go to Saudi Arabia -- and not even back to the UK? Besides, if he indeed 'chose' to go to Saudi Arabia, why did dozens of police goons have to be used to make him get into the bus which then took him to the plane? Or all the reports that say that he was forced and physically manhandled to board the flight to Jeddah fabrications by a media bent on maligning the present government? Surely, the people are also not fools to think that, as claimed by the government, the plan was the baby of the interior ministry. Who hatched the scheme and in this a report dated Sept. 11 in Dawn is instructive in that it claims the plan was coordinated by the Pakistani government and had the blessings of Washington (which explains what Assistant US Secretary of State for South Asian Affairs Richard Boucher was doing in Islamabad days before the scheduled inter-governmental dialogue with the Pakistan government -- which began in earnest on Sept. 12) and the direct involvement of Saudi Arabia's intelligence chief. After all the latter was the one who held a press conference, along with Rafik Hariri's son, in Islamabad where the agreement between the Sharifs and the Saudi government and Pakistan was shown to journalists. Also, there has not been a whimper of protest on this from Benazir Bhutto -- and in fact one foreign newspaper, The New York Times, quotes an unnamed American official as saying that the deportation of Nawaz Sharif was not such a bad thing, implying that it would pave the way for Ms Bhutto to return to Pakistan -- which she apparently intends to sometime in October -- where there will be (yes, you guessed it right!) no hindrances created by the current government on her arrival and ensuing movement within the country. Obviously, Mr Sharif's recent statement -obviously directed at the Americans - that he too could be relied on to fight the war on terror wasn't enough to sway Washington to his side. As for Ms Bhutto, her impending deal with President Musharraf, at a time when another major opposition figure has been 'deported' pretty much against his will, will not hold her party in good stead. One can only wonder what those who have some ethics and morals in her party -- people like Aitzaz Ahsan and others like him -- have to think about all of this.